Cable unfolded as expected and both targets were reached and exceeded by 4 pips before reversing directions and moving towards the upside. This week`s main count expects Cable to continue towards the downside in a motive manner within an ending diagonal while the alternate count expects that Cable has more to offer towards the upside in a corrective wave (ii). In a nutshell, the main count expects one last push towards the downside before reversing directions towards the upside in a mid term uptrend. While the alternate count expects that downwards movement has more to offer towards the downside. Elliott Wave chart analysis for the GBPUSD for 26th December, 2014. Please click on the charts below to enlarge. This count expects that wave B maroon is complete and that wave C maroon is unfolding towards the downside. Within wave C maroon wave (1) black is at its late stages. Wave (1) black is unfolding as an impulse labeled waves 1 through 5 blue with waves 1 through 4 blue complete and wave 5 blue is unfolding towards the downside. Wave 2 blue unfolded as a zigzag labeled waves a, b and c pink. Wave 3 blue unfolded as an impulse labeled waves i through v pink with wave iii pink unfolding as an impulse labeled waves (i) through (v) green. Wave 4 blue unfolded as a double combination labeled waves w,x and y pink with wave y pink failing to create a new high above the end of wave w pink. Wave 5 blue is expected to be unfolding towards the downside as an ending diagonal with waves i through iv pink are expected complete and wave v pink is unfolding towards the downside. This count would be confirmed by movement below 1.5486. At 1.5464 wave v pink will reach 0.618 the length of wave iii pink. This count would be invalidated by movement above 1.5683 as wave iv pink may not exceed the end of wave ii pink within an ending diagonal and it should be noted that the invalidation point will be moved to the end of wave iv pink once we have confirmation on the hourly chart that wave v pink is unfolding towards the downside. Also this count would be invalidated by movement below 1.5389 as by movement below that level wave iii pink will be the shortest wave and that violates Elliott`s rule that a third wave cannot be the shortest wave. This count expects that wave 5 blue is unfolding towards the downside as an impulse. Within wave 5 blue waves i and ii pink are expected complete and wave iii pink is extending towards the downside. 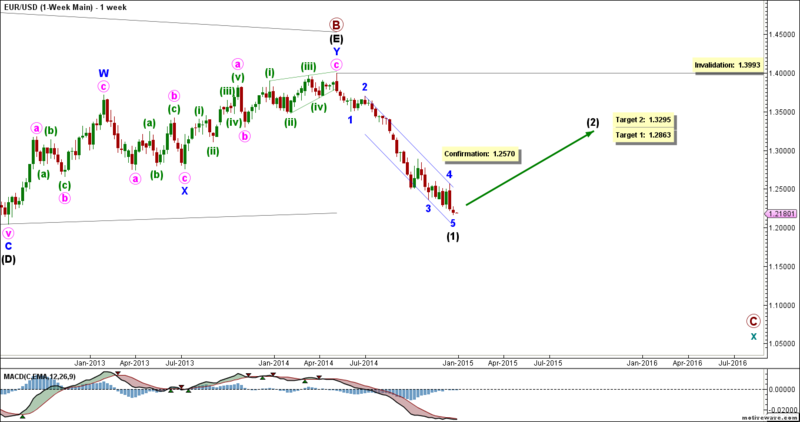 Within wave iii pink wave (i) green is expected complete and wave (ii) green is unfolding towards the upside. At 1.5607 wave (ii) green will reach 0.618 the length of wave (i) green. This count would be invalidated by movement below 1.5486 as within wave (ii) green no B wave may retrace more than 100 % the length of an A wave. As well this count would be invalidated by movement above 1.5683 as wave (ii) green may not retrace more than 100 % the length of wave (i) green. For the first week in a very long time, price has formed a relatively very small Spinning Bottom, which is a sign of indecision. Coupled with the deeply oversold momentum conditions and an Elliott Wave pattern that seems mature enough to be complete, perhaps the time has come to see if the new year will start with a bullish reversal. And speaking of the new year, be sure to check our current holiday special offer at https://www.elliottwaveforex.com/welcome2015/. Elliott Wave chart analysis for the EURUSD for 26th December, 2014. Please click on the charts below to enlarge. Cycle wave x is unfolding as a zigzag labeled primary waves A, B and C.
Primary wave A was an impulse. Primary wave B formed a contracting triangle labeled intermediate waves (A) through (E), each subdividing as a zigzag labeled minor waves A, B and C, except for intermediate wave (E) which formed a double zigzag labeled minor waves W, X and Y. Intermediate wave (E) reached just short of 61.8% the length of intermediate wave (C), and it retraced a bit short of 61.8% of intermediate wave (D) — both of which are very dependable Fibonacci relationships, highly suggesting that primary wave B is complete. Primary wave C is unfolding as an impulse labeled intermediate waves (1) through (5). Intermediate wave (1) is forming an impulse labeled minor waves 1 through 5. Within it, minor wave 2 retraced 38.2% of minor wave 1. Minor wave 3 reached a bit over 261.8% the length of minor wave 1. Minor wave 5 just reached 78.6% the length of minor wave 1. This count expects intermediate wave (1) to be either complete or very near completion, and that the euro will start moving toward the upside in intermediate wave (2). This will be initially confirmed by movement above 1.2570. The MACD indicator is about to form a bullish crossover and the Stochastic indicator is very deeply oversold. At 1.2863 intermediate wave (2) would retrace 38.2% of intermediate wave (1), then at 1.3295 it would retrace 61.8% of its length. This wave count is invalidated by movement above 1.3993 as intermediate wave (2) may not move beyond the start of intermediate wave (1). 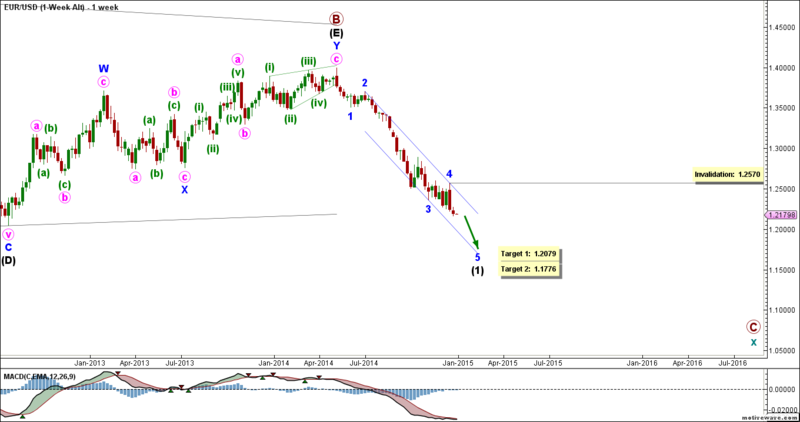 This count expects minor wave 5 to be still unfolding toward the downside. At 1.2079 minor wave 5 would reach 100% the length of minor wave 1, then at 1.1776 it would reach 161.8% of its length. This wave count is invalidated by movement above 1.2570 as this is the start of minor wave 5.